One day in middle school I decided that I was going to be a vegetarian. I grew up in Seattle and it seemed that in the 90's everyone was turning away from meat. So I jumped on the bandwagon. Only problem was that both of my parents still ate meat and I had no idea what to eat. I would love to say that I was great about eating beans and a variety of healthy foods. That would be a lie. I was horrible with my diet. I was heavily involved in swimming and dancing in high-school and I lived on yogurt and fake meat products, and cheese. A lot of cheese. There was one other food that I feel in love with and still use frequently today, tofu. I love how easy and versatile tofu is to use in baking and cookies and my oldest son loves it! I eventually gave up on being a vegetarian after over ten years. I was a horrible vegetarian to begin with and I became very anemic. I didn't give up tofu though and I love to use it in recipes. 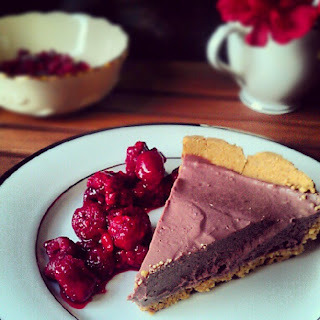 This week I tried a new recipe for Chocolate Raspberry Tofu Pie from Eating Well Magazine, which looked very easy and delicious. This recipe has 8 ingredients. It takes 2 1/4 hours of total time, 15 minutes of which is active and makes 10 servings. I did make a few modifications. First instead of semisweet chocolate chips I used dark chocolate chips. I'm a big fan of dark chocolate and use it frequently in recipes. For the raspberries I used frozen, the fresh raspberries at my local supermarket were less than stellar so I passed. Since my kids were going to be eating the majority of the pie I substituted a low-fat graham cracker crust instead of a regular. My blender had a horrible time with the tofu, I would suggest using a food processor instead. My pie came out much more purple than the magazine photo, but it was still yummy! I followed the remainder of the recipe as written. With my oldest home for summer break we have been going through a ton of food. I literally have been baking twice a day to keep up with my two growing boys. I love that this recipe uses tofu in a dessert. The texture was delicious and both of my boys absolutely loved this recipe. I will definitely be making this again! For the recipe go to Chocolate Raspberry Tofu Pie. I may not be a vegetarian, but I've had such an appreciation for tofu for the past few years. I really want to try this! Oh my gosh!! This looks heavenly. I am such a huge fan of dark chocolate. The tofu is a nice twist! Please don't forget to like us on Facebook Thank you for linking to Foodie Friday! Thanks :) I hope you come and visit again soon! I did this last year--to the T! No problem :) It really is yummy!